Mouse anti Human Aggrecan antibody, clone 7D4 recognizes human aggrecan, a proteoglycan and member of the aggrecan/versican proteoglycan family, which forms a major component of the extracellular matrix (ECM) of both cartilage and the central nervous system (CNS). Studies using a panel of core protein-directed antibodies against human aggrecan, revealed the distribution of different aggrecan isoforms within the CNS, and sub-divided the isoforms into clusters 1-5 accordingly. These studies also showed a difference in the relative abundance of these isoforms when comparing brain and cartilage tissues (Virgintino et al. 2009). 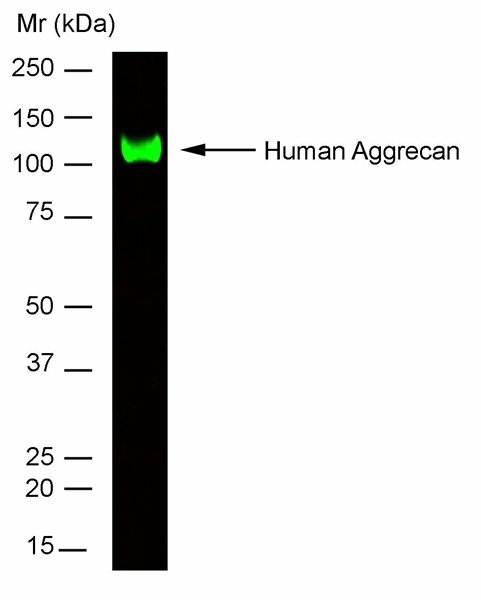 Mouse anti Human Aggrecan antibody, clone 7D4 recognizes epitopes within the N-terminal G1-IGD-G2 region of aggrecan, that has been identified as a cluster 1 isoform.